These days a buck or two just isn't going to cut it. Tipping is a custom that flummoxes some, frustrates others, and still others depend on to make a living. The U.S. Department of Labor only requires employers of tip-based workers to pay them $2.13 an hour. The assumption being that tips will buoy the worker’s income to at least the federal minimum wage (currently $7.25 an hour.) Essentially, tipping is a form of subsidization, which allows employers to pay their workers less per hour and still comply with labor laws, depending on the customers to make up the shortfall. Presumably, these savings are then being passed along to you the customer in the form of less expensive food and drink. According to the Bureau of Labor Statistics, service industry workers represented three-fifths of all workers earning minimum wage or below in 2012, primarily in food preparation and serving. In short, service employees depend on your generosity to live. Of course, there’s no one-size-fits-all solution, hence the confusion some people have regarding what’s an appropriate amount to tip. A good rule of thumb to remember is if someone is providing you a service that you otherwise would have to perform yourself, and they do it well, gratuity should pretty much be automatic. 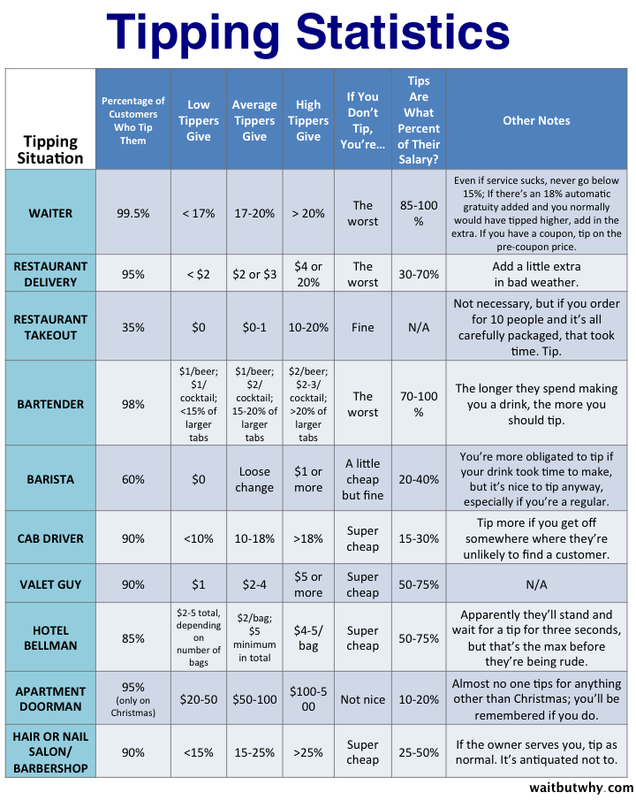 The blog WaitButWhy has a great table showing a variety of tipping-related data, which is both illuminating and entertaining. The point of all this is to hopefully clarify any confusion or misconceptions out there and help you navigate a range of tipping scenarios. Food delivery drivers are a group of service workers for whom generous tips are especially important (speaking from experience.) The vast majority of them use their own vehicles, covering scores of miles or more per shift and shortening the lives of their cars in the process. People take for granted that having freshly-made food whisked directly to our front door, an unthinkable luxury in large swaths of the world, is so readily available to us. But you shouldn’t take the driver for granted as a result. James Evan, a delivery driver for a restaurant in central Florida, says the expectation of speedy deliveries pressures drivers to push their cars to the limit. With gas prices hovering around $3.50 per gallon, and factoring in the necessity for more frequent maintenance and other repairs incurred by using your personal vehicle to deliver food, a $2 tip really doesn’t cut it anymore. Consider: you could have gotten the food in person yourself and taken it back home to eat, but instead opted to have it brought to you out of convenience. Would you change your mind if someone offered you $2? Probably not. When it comes to delivery drivers, tippers should consider the first $2 of the tip as gas money and tip on top of that. I almost never tip a delivery driver less than $5. Especially if it’s somewhere I frequently order from. Delivery drivers remember the generous customers, and you will get better service as a result. When it comes to tipping bartenders, a lot of people have out of date information. The old guideline used to be $1 gratuity per drink, but now many favor a percentage-based approach to tipping your local suds slinger, especially if you’re ordering complicated cocktails or a ton of drinks at once. A buck is ok if they open a bottle and place it in front of you or pour a beer from a tap into a glass, but anything that takes up more than a minute or so of their time should be rewarded more generously. When you order drinks during a sit-down meal, the days of omitting the alcohol from your tip calculation are as dead as disco. 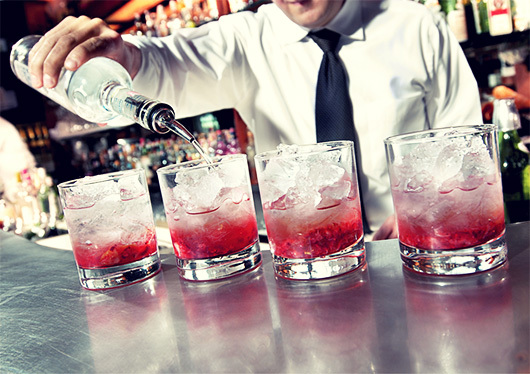 Many restaurants pool tips among the servers and bar staff, so if you stiff a waiter on booze on the grounds that they didn’t prepare the drinks (though sometimes they actually do), you might actually be stiffing the bartender. Not cool. Now, people who tip poorly or not at all don’t necessarily have ice water running through their veins. It might simply be a clash of tipping cultures. “Most times when people don't tip it is a cultural issue. People who come from countries where employees are paid salaries or higher hourly rates are accustomed to not tip on top of what they order. Employees in these countries even find it offensive when someone tips on top,” said Matthew Christopher, a bartender and restaurant worker in New York City. This highlights the importance of learning the local protocols on gratuity while traveling abroad. It’s the responsibility of the patron to know the local customs and tip accordingly. This little verbal confirmation instantly inoculates me against that slight twinge of guilt I feel drawing a zero on the tip line. You have tipped them already, and generously at that. Don’t fall into the psychological trap that makes people double-tip simply because they see the line there for extra gratuity. Another should-I-or-shouldn’t-I tipping situation bubbles to the surface when you’re picking up take-out food from a local restaurant. If you drove yourself to pick up a pizza, are you supposed to tip the person behind the register? I mean, the receipt DOES have a line for gratuity right above the signature line. My theory about that is two-fold. The less cynical being that receipt printers have default settings that just print based on templates, which include a line for gratuity as it would if you sat down to eat at the restaurant. I’ve even gotten credit card receipts at convenience stores bearing a gratuity line, which supports this theory. The slightly more suspicious possibility is that as with hotel room service receipts, it’s a bit of harmless but effective psychological chicanery. If you see a line on a receipt that says “gratuity,” your natural instinct to not want to seem cheap or be perceived as un-generous kicks in. My thinking on tipping for take-out orders is that unless you’re picking up a large or complicated order that had to be meticulously bagged by the people behind the counter to separate cold from hot items, large soda bottles, etc., you can leave the gratuity line blank. Bottom line, if you want to tip the counter workers by all means do, but I don’t think they’re expecting a tip from take-out customers. For the adventurous traveler, tipping at hotel check-in can net some unexpected perks. The so-called “$20 trick” has become something of an Internet sensation among Las Vegas travelers, who have used the method to obtain all kinds of room upgrades from a fairly impressive roster of Sin City hotels. How it basically works is by slipping a folded $20 bill between your credit card and ID when you pass it to the desk clerk at check-in (a “$20 bill sandwich” as many call it.) You then ask if there are “any complimentary upgrades available.” People report their results on a website dedicated to the trick, detailing how they offered the $20, whether they were successful and what if any upgrade they received. Be warned, some have reported mixed results. But what are you doing in Las Vegas if not to gamble, right? Tipping while on a date is also a potentially precarious situation. Along with the universally known maxim that how you treat the server on a date is a huge indicator for what kind of a person you are, how much gratuity you leave on the check sends a signal about your attitude towards money as well as your generosity. But there’s a line to walk. Obviously you don’t want to under-tip but you also don’t want to be too splashy with an excessively generous tip, which could give a show-offy impression that turns your date off. Twenty percent is a tip you can really set your watch by in this scenario. If your date peeks at the bill (let’s face it, everyone does it), you look like a good guy. It should go without saying, but if your dinner partner is someone you’re trying to get to know, don’t make a point of broadcasting how much you are tipping. It’s obnoxious. 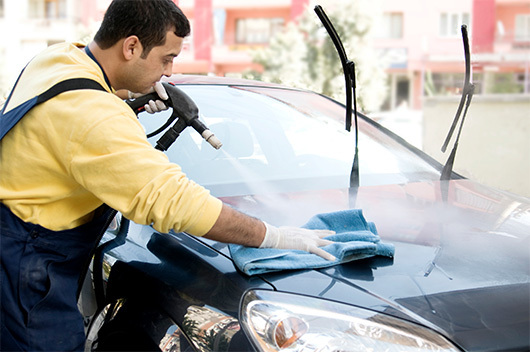 Washing your car is another bit of drudgery many people outsource instead of doing themselves. I’m aware of a subset of the population that derives a certain Zen-like joy from washing their cars themselves, but I am not among them. For the rest of us, that means car washes. While machines do most of the work, the finesse at the end comes from the towel guys, whose attention to detail could make or break your car’s shiny new look. Here I usually tip $2-3 per towel-bearer. The money usually goes straight into a box with a slot and a big lock on it to be shared among the workers at the end of each day. Given the assembly line nature of their work, that could add up to a pretty decent pile after an eight-hour shift in which every car tips a dollar per man. If you get your ears lowered at an old-time, smoky barbershop with a red-and-white striped pole out front, $3-5 is more than appropriate. 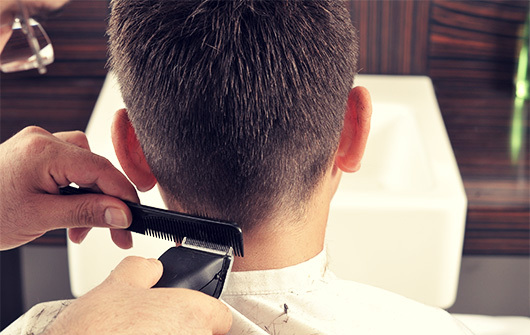 I usually round up to an even $20 since simple men’s haircuts usually run between $14-$16 and take all of 10 minutes. If you chat about baseball and get a chuckle every once in a while with the barber, a thank you card with $20 or so in it around the holidays is appropriate but not necessary. However, if you’re spending big bucks to attain a perfectly coiffed ‘do at a high-end salon where they offer you chilled cucumber spring water or a cappuccino, your tip should increase accordingly. Twenty percent and up is appropriate here, again partly depending on your relationship with the stylist. Want to feel good about yourself around the holidays and make others feel good about you at the same time? Earmark $100 or so to be doled out as gratuity for the people who perform services for you or your household throughout the year, even if it’s a service where a tip isn’t generally expected. I get a lot of packages, so around the holidays I like to tip my mail carriers $10 or $20 each with a card thanking them for their efforts all year. I also slip the grocery baggers $5 or $10, even if they normally refuse tips, and you can often convince a reluctant bagger with a grin and a ‘holiday spirit’ reference. If you rent, don’t forget the building super or maintenance workers. If they take care of you, you should take care of them. Depending how often you call on them, $20 to $50 apiece would be very much appreciated, not to mention remembered when a water pipe explodes under the sink at 3 in the morning on a Sunday. Growing up I had friends whose dads would tip the trash collectors at the holidays with a case of beer, which they always appreciated, but I’m sure cash would be appreciated too if you’d rather go that route. Service industry workers are in many ways unsung heroes. Sadly, they’re frequently underappreciated or under-considered. It’s the nature of their work and they do what they do well and without complaint. It’s important work, too. Without them, the niceties in life we take for granted would be a lot less nice. Be conscious of the fact that these are hard-working people who help make your already comfortable life a little more comfortable. So keep that in mind, and keep some cash on hand. Because chances are it won’t be long until the next time you have your car washed, your hair cut, or your food brought to your front door by someone who isn’t you. Great article! One place that I’d appreciate your comments are how to tip at breakfast joints. Its nearly impossible to spend more than 8-10 bucks at a greasy diner but a $1.50-2.00 tip seems stingy if I’ve sat for more than half an hour with a couple refills. I lean more towards stepping outside of the 15-20% mark and leave a couple extra bucks, but what do you think? Do the waters and waitresses expect only a buck or two on a cheap ticket? I have always heard to tip extra for “breakfast joints.” Good reminder. Good question below about breakfast joints or cheap lunch spots. I have heard the 20% or $6 (whichever is higher) but that seems excessive sometimes. How about housekeeping at hotels? For Pick-Up Orders: At the restaurant where I used to work, the server did everything. Answer the phone, take the order, cook the appetizers, pack it up, etc. Getting a $50 take-out order put together took time and energy and also took us away from our tables, so some sort of tip was not just appreciated, but expected. When we spent several minutes assembling large orders and didn’t even earn a dollar out of it, we’d be a bit miffed. Also: If you’re ordering take-out from somewhere on a regular basis, tipping the staff will make them happier to see you each week. 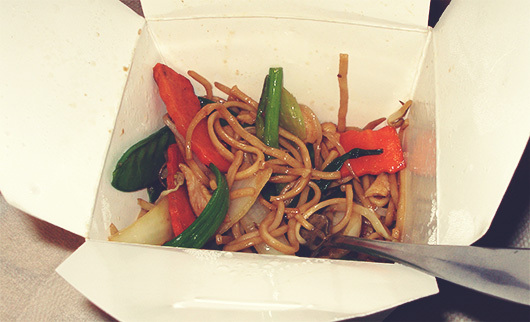 A happy staff is less likely to drag their feet and more likely to throw in extra fortune cookies. I always like to leave a fat tip if the service is outstanding and will leave the minimum if I was ignored. Great Article! I wish we would evolve and just pay employees what they’re worth. With that being said, I feel strongly that I tip pre-tax, thoughts? I understand the reasoning behind tipping pretax, but practically not sure it’s worth worrying about. On a $60 meal the difference between tipping pretax / post tax is only about $1. I usually run a tab then leave a percentage based on service. If I am always the guy waiting at the end of the bar while you do shots with your friends, your gonna have a bad time. I always overtip. I have worked in food service, though not in a tipped position. I know how hard and grueling that job can be. Personally I’d like to see the tip system abolished and have tipped workers make more but until that is the case, I will continue to tip. One other thing with delivery drivers, their personal car insurance likely won’t cover them while driving for their job and some carriers will refuse to insure them period if they are a delivery driver. So they run an extra risk.